Shop’List is a free Windows 8 Shopping List Manager app that lets you create and manage your shopping lists in an easy way. 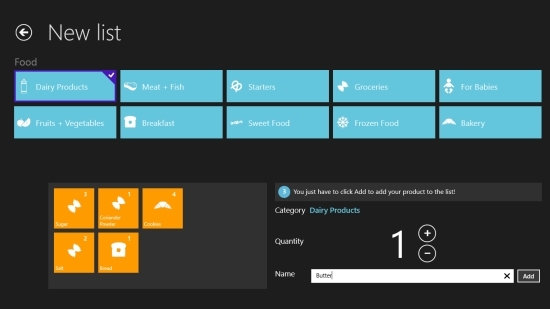 Using this free Windows 8 Shopping List Manager app, you can create multiple shopping lists by choosing products under various categories, and save them in the app. You can also review these shopping lists later or edit them, if required. The app is very efficient in managing multiple shopping lists. It displays a number of categories to choose from, to let you make comprehensive shopping lists. These categories include Beverages, Children, Clothes, Food, Games + Toys, Home, and Multimedia. Each category further displays various sub-categories, thus simplifying your effort. An added advantage is that this app is integrated with Windows 8 Share charm. So, you can also share these shopping lists via e-mail. Shop’List is freely available in Shopping category of Windows Store. You can also view the app directly in Windows Store using the link given at the end. 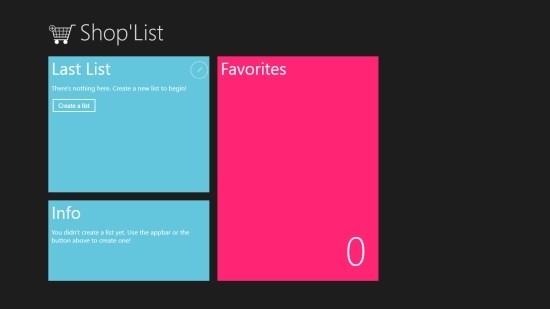 Let’ see how you can use this free Windows 8 Shopping List Manager app to manage your multiple shopping lists. Though Shop’List is a handy app but it’s very comprehensive and capable of efficiently managing your shopping lists. To use this app, just install it on your Windows 8 PC. As you launch the app, you will be taken to the main screen of the app displaying Last List, Info, and Favourites penal. Click on ‘Create a list’ button on the Last List panel or use the app’s bottom flyout to add a new list (appears by right clicking on the screen). Select from the various categories and sub-categories displayed, enter the desired item and select quantity. Now, click on Add button to save it to the list. You can add as many items as you want, to the list in the same way. You can save the list with a desired name using Save option displayed in the bottom flyout. All the shopping lists that you made in this app appear as a menu on the main screen. You can easily open, edit, and delete shopping lists anytime from the app. To edit a list, click on the edit icon displayed on the top right corner of that list menu, to open the list. Select the item you want to remove or add to your favourite. A bottom flyout will appear with the desired options to process the operation. 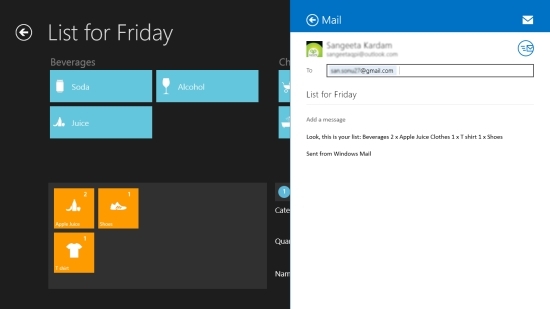 Not just this, you can also share these shopping lists via e-mail, using the Windows 8 Share charm. So, now you can always have them with you! Also check Deal Groupie and My Cowboy Boots. 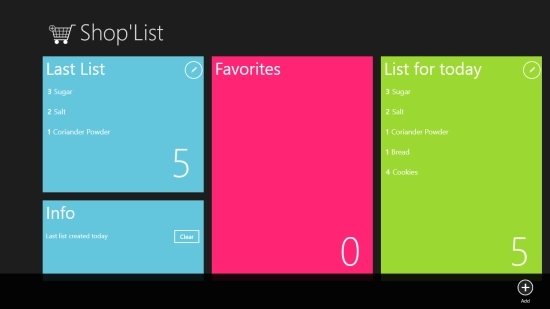 Shop’List is a fantastic free Windows 8 Shopping List Manager app to help you create and manage multiple shopping lists easily. You can share these shopping lists with friends and family on e-mail and always have them with you. Definitely a useful app to keep your shopping lists organised. Do try it out and share your feedback via comments.